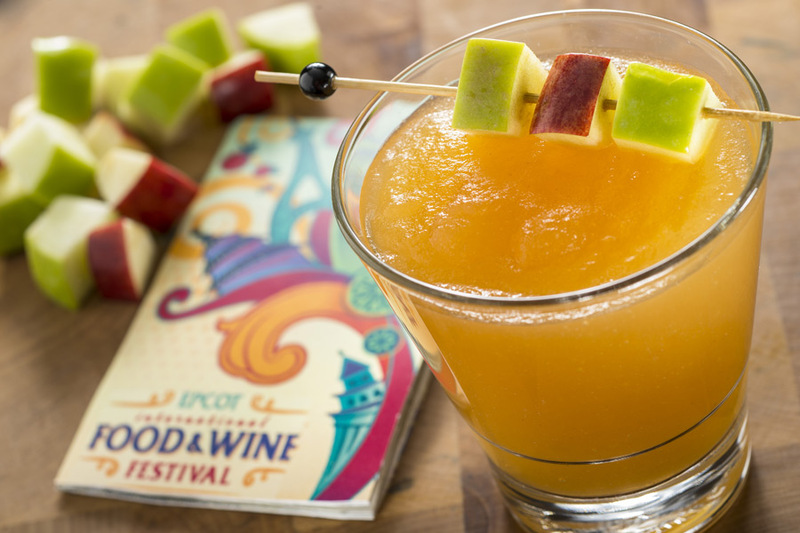 Epcot Food and Wine Festival is going on now and will run through November 16th. 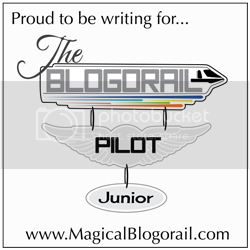 We went last year and it far surpassed my expectations. I consider it a can’t-miss event. I will give you some brief information and some reasons for you to attend the event. I will also give samplings of the menus from all 38 Marketplaces. It is getting a bit late for this year’s festival, but it is never too late to plan for next year! 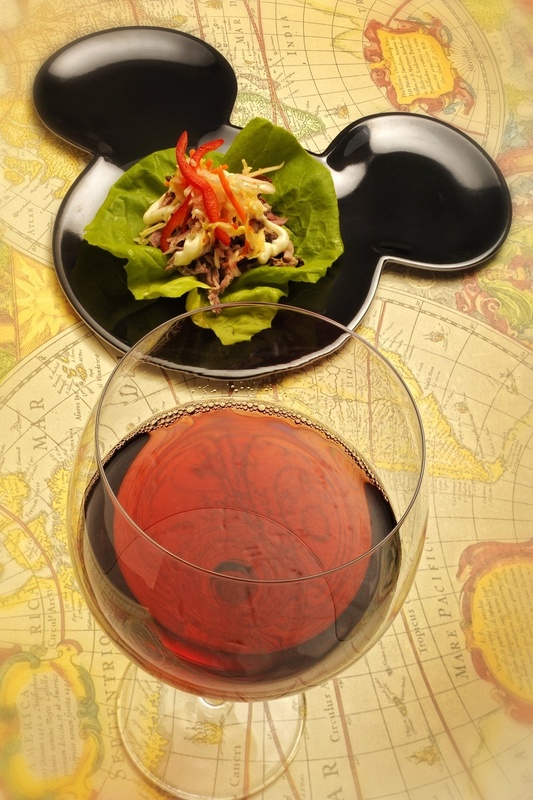 Mickey- head- shaped plate with appetizer and wine. 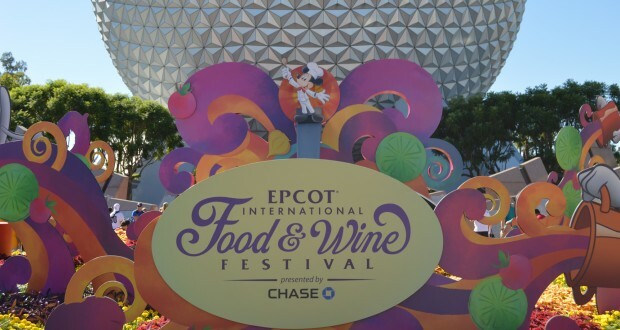 The Epcot Food and Wine Festival encompasses food and wine booths scattered throughout the World Showcase at Epcot. 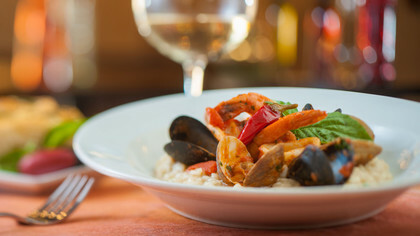 There are also tasting events, premium food and wine packages available, an Eat to the Beat concert series (featuring oldies but goodies such as Rick Springfield, Air Supply, Starship, and others), celebrity chefs, culinary demonstrations, wine and beverage seminars, scavenger hunts for kiddos, merchandise shops, and more. 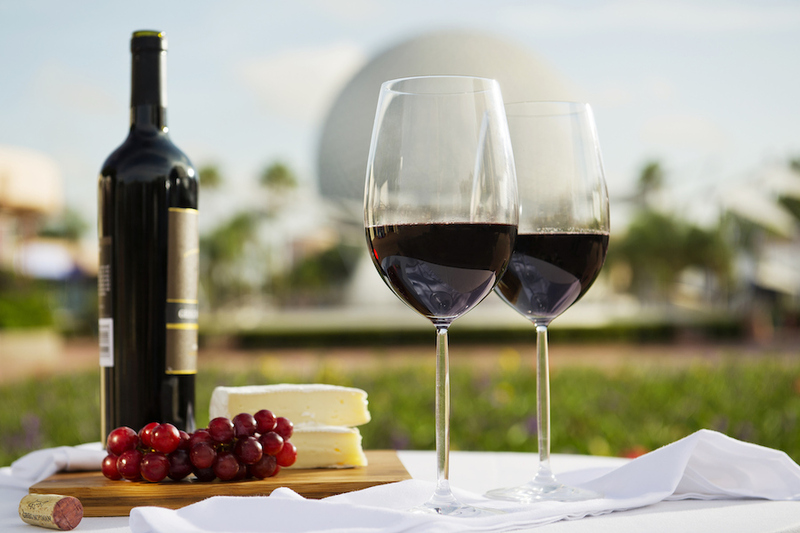 Epcot has been hosting the food and wine event for 20 years. This year, 38 different booths will be serving food, wine/alcohol, or both. There are 5 new booths with such tantalizing treats as Karst cave-aged cheese served with honey, La Bonne Vie goat cheese served with Craisin bread, and Olive oil poached salmon with fresh corn, bacon and pepper jam. The new booths featured are: Cheese Studio (yum! ), Chew Labs, Dominican Republic, Sustainable Chew, and Wine Studio. I am going to list some of the delicious food choices. Most all of the food is priced between $4-$8. The wine and other alcohol is similarly priced. The portions are smaller, but the prices less than most Disney food. This allows you to try 2-3 things and still spend about what you would spend for most meals at Disney World. Last year we split our food up and the three of us got to try even more new things. 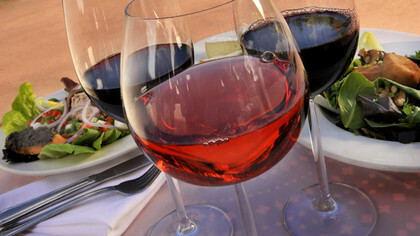 There is so much to list, I am going to just list each Marketplace (food and wine booth) with 1-2 selections from each. 1)American Adventure Coffee Cart-Apple Maple Spice Latte. 2)Africa-Berbere-style beef tenderloin tips with onions, jalapeños, tomato and pap. 3)Australia-Grilled sweet and spicy bush berry shrimp with pineapple, peppers, onions and snap peas. 4)Belgium-Belgian Waffle with Berry Compote and Whipped Cream. 5)Block & Hans-Champagne Enchantee Brut; Festival Chardonnay. 6)Brazil-Crispy pork belly with black beans and tomato; Brazilian cheese. 7)Brewer’s Collection-Radeberger Zwickel Pilsner; BraufactuM Progusta IPA Norbertus Special Hefeweizen. 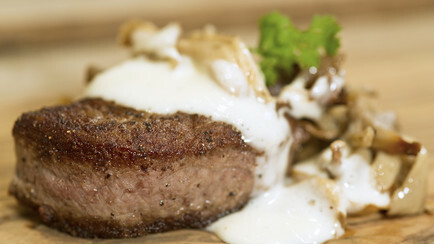 8)Canada-Canadian Cheddar Cheese Soup; “Le Cellier” Wild Mushroom Beef Filet Mignon with Truffle Butter Sauce (gluten free). 9)Cheese Studio (NEW)-Trio of artisan cheese: Karst cave-aged cheese served with honey, La Bonne Vie goat cheese served with Craisin bread, Rogue Creamery Oregon Blue Cheese with berry port compote; Cheese fondue with sourdough bread. 10)Chew Labs (NEW)-Olive oil poached salmon with fresh corn, bacon and pepper jam; Liquid nitro chocolate almond truffle with warm whiskey caramel. 11)China-Chicken potstickers; Tsing Tao Beer. 12)Craft Beers-Craft beer snack mix: sweet and savory blend of nuts, fruits and crackers; Brew Hub Keybilly Island Ale, Lakeland FL. 13)Desserts and Champagne-Chocolate cherry explosion; Strawberry-basil champagne “toast”. 14)Dominican Republic (NEW)-Lechon aside: Roasted pork with mangu, pickled red onion and avocado; Caramel flan with rum-roasted pineapple. 15)Farm Fresh-Leaded mac ‘n cheese with Nueske’s Pepper Bacon, cheddar cheese, peppers, and green onions; Woodchuck Raspberry Hard Cider. 16)France-Croissant aux escargots with garlic and parsley; Cabernet Sauvignon, Bordeaux, Chateau Bonnet. 17)Fife & Drum-Ghirardelli ice cream sundae; Mmmhops Pale Ale. 18)Germany-Roast Bratwurst in a Pretzel Roll; Selbach-Oster Mosel Riesling Spatlese. 19)Greece-Vegetarian moussaka with Gardein sausage crumbles; Spanakopita. 20)Hawaii-Kalua Pork Slider with Sweet and Sour Dole Pineapple Chutney and Spicy Mayonnaise. 21)Hops and Barley-New England Lobster roll; SweetWater Take Two Pils. 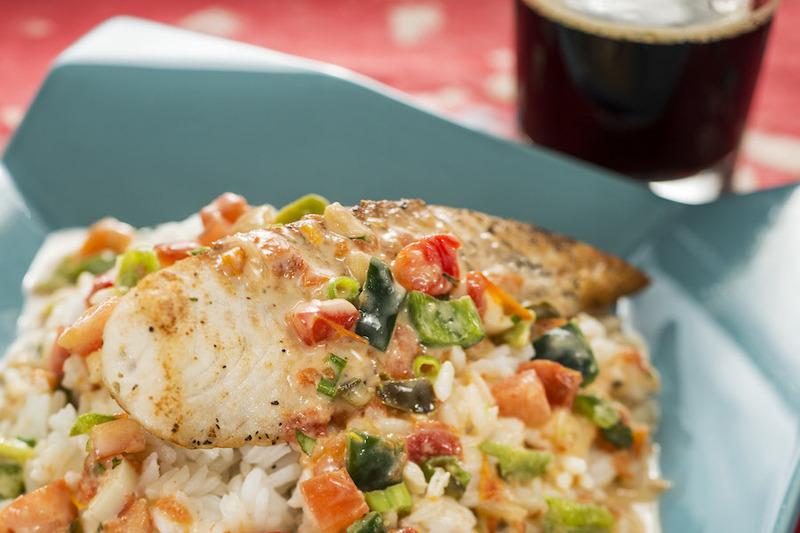 22)Ireland-Lobster and Seafood Fisherman’s Pie; Kerrygold Irish Cream Liqueur. 23)Intermission Cafe-Southwest chicken wrap; Festival Chardonnay. 24)Italy-Ravioli alla caprese: cheese ravioli, tomato sauce, mozzarella, parmesan and basil; Pinot Grigio Placido. 25)Japan-Teriyaki gyoza bun: steamed bun filled with chicken, vegetables and sweet teriyaki sauce. 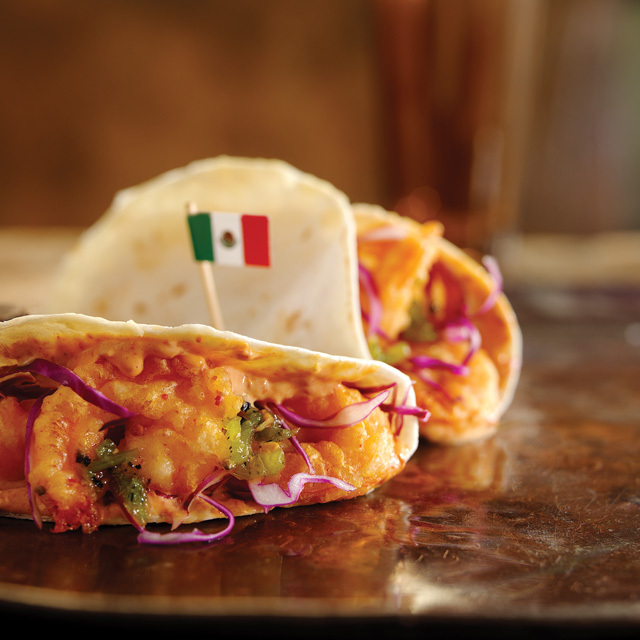 27)Mexico-Tacos de camaron: battered shrimp, pico de gallo, pickled onions, and chipotle mayonnaise. 29)New Zealand-Steamed Green Lip Mussels with Garlic butter and toasted bread crumbs. 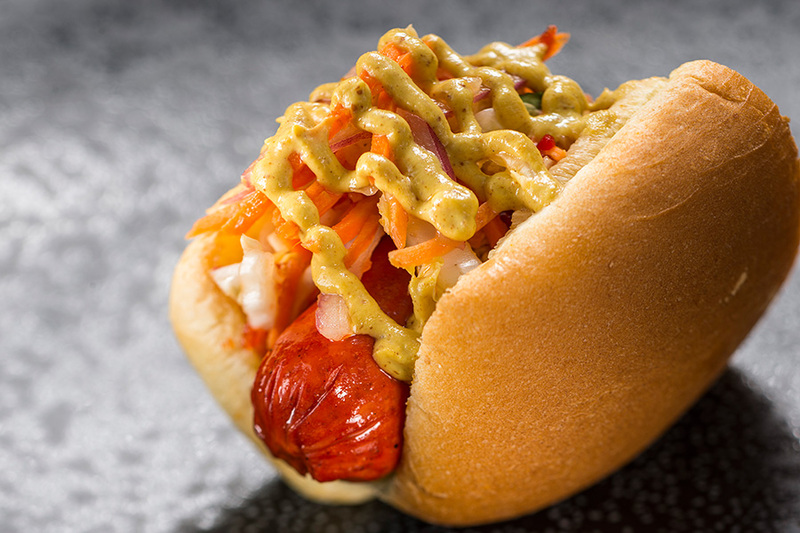 30)The Outpost-Spicy hot dogs with kimchi slaw and korean mustard. 31)Patagonia-Roasted Verlasso salmon with quinoa salad and arugula chimichurri (gluten free). 32)Poland-Kielbasa and Potato Pierogies with Caramelized Onions and Sour Cream. 34)Refreshment Port-Pineapple Dole Whip soft-serve ice cream. 35)Scotland-Fresh potato pancake with smoked Scottish salmon and herb sour cream (gluten free). 36)South Korea-Korean Barbecue Short Rib with steamed rice and cucumber kimchi. 37)Sustainable Chew (NEW)-Pork spareribs with red wine, fennel and cheesy mascarpone grits. 38)Wine Studio (NEW)-Trio of artisan cheese: Karst cave-aged cheese served with honey, La Bonne Vie goat cheese served with Craisin bread, Rogue Creamery Oregon Blue Cheese with berry port compote; Aviator Pinot Grigio, Oregon.